As a customer centered company, we strive to provide personalized solutions for our customers. This requires application expertise and a willingness to listen and learn about our customer’s needs then respond with innovative designs. As a System Integrator, we provide turn-key project management services including system design, equipment selection and placement, electrical integration, installation, start-up and operation/safety training. 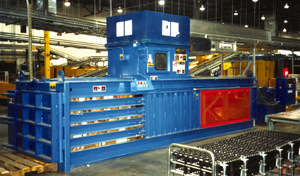 We have been designing waste handling systems to meet the demanding requirements of a wide range of markets throughout the US including Recycling, Corrugated, Printing, Paper converting, Document Destruction, Scrap Metal processing and Warehouse Distribution for over 30 years. We realize that although individual plants within the same industry may use the same type production equipment, the solution for each plant can often be quite different. Whether it’s a small baler or a complete mechanically-fed, bulk baling system, DeHart Recycling Equipment will design a system to meet your current and future production requirements. Controlling scrap to keep scrap from controlling you is the basis on which all DeHart Recycling Equipment systems are designed. All DeHart Recycling Equipment system components work together for maximum efficiency to eliminate loss of time and production. We represent many quality manufacturers, so you get the right equipment for the job. After initial contact and discussions, our project engineer will visit the job site to evaluate your current operation and discuss your needs with the plant personnel involved with the project. We research previous equipment applications and projects to develop the most effective means to address the client’s needs. After fabrication of equipment, it is cleaned and painted to customers’ specifications then assembled on site to test before shipping to the customer. From initial design to installation and start up, all components are designed and built to the highest standards to guarantee years of trouble free service. Our customers benefit from our experience in understanding various product applications. Each application is unique with various factors contributing to how a product will respond such as product density, memory, volume and moisture among others. Additional factors greatly influence the equipment decision for a specific project like the customer’s budget, space, constraints, logistics and labor preferences. Our project engineers bring a breadth of expertise that is matched by few in the recycling industry. The results are evident in the systems that we have installed. DeHart Recycling Equipment has decades of experience supplying shredding and baling systems for the document destruction industry. The need for confidential destruction of records and documents has never been greater. Whether you are a start-up in need of a small strip-cut shredder or a downstroke baler or you are looking for a high production system, DeHart Recycling Equipment can provide you with a custom made solution that to make your document destruction operation more efficient. 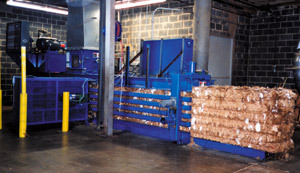 As a systems designer, fabricator and integrator, we can provide turn-key systems including Conveyors, Shredders, Balers, Dust collectors and material handling equipment. We have the knowledge to help you maximize your profit through improved product flow, improved dust filtration, reduced maintenance costs and reduced labor. We have worked with hundreds of recyclers to provide solutions for handling and processing their material stream. The bulk of materials accepted at most recycling plants is the same: cardboard, office paper, newspaper, printer’s waste, junk mail, plastic bottles and film, aluminum and tin cans. However, this is where similarities end. Each operation has a unique product mix, product form, delivery method & schedule, seasonal variations, space and power constraints and labor needs. For all these reasons, the optimal solution for your needs requires careful evaluation by experienced, trained equipment & systems experts who will take time to learn about your business. Let us work for you by providing the guidance, intelligent design, quality equipment and superior service support necessary to keep your plant running efficiently and reliably. Determining the proportions of each category of material, allows us to better tailor a recycling system to your waste needs. 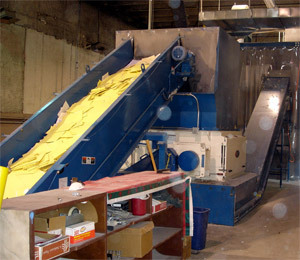 Allow us to be your single source for your recycling equipment needs. Our systems incorporate the latest technology and will return real value to your bottom line, today and well into the future. We can design and install an efficient, economical system that will quickly transform your trimming problems into trimming solutions. Working with DeHart Recycling Equipment means efficient trim conveyance, effective dust control and functional grade segregation and improved plant cleanliness. Our high-speed solutions manage trimmings at a fast pace that can boost your productivity and profitability. 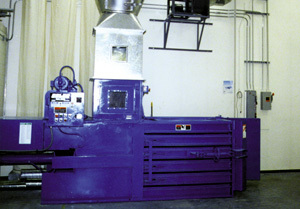 We have systems available to handle from low volumes to over 10 tons per hour. Box plants, sheet converters, food and pharmaceutical packaging, POP displays… the folding carton industry covers a wide variety of products, but the scrap management issues have much in common. Dusty environments, poor grade segregation, light bales, overburdened air conveyance systems; all contribute to reduced scrap revenues, decreased production and increased labor costs for you. 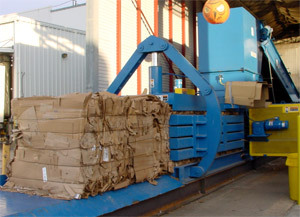 DeHart Recycling Equipment has helped many folding carton operations overcome these problems with efficient scrap removal systems. We understand your industry and we have the tools to resolve your scrap issues effectively and your operations running at peak efficiency. As certain as your plant will receive and ship product, you will need to contend with a constant accumulation of scrap corrugated boxes, plastic wrap and banding. This material is not just a nuisance. Handling it properly creates a potential source of revenue that also provides an opportunity to create a safer, greener workplace. Allow us to put our expertise to work for you by providing a customized material handling solution to reduce labor costs, enhance your efficiency and increase your profitability. Scrap yards are rugged, demanding environments that demand heavy-duty equipment designed to handle a wide range of products and conditions. Material flow and operational efficiency are keys to success in this competitive industry. Solutions, therefore, are as much about designing and installing a system to improve your productivity as choosing a specific machine. For this reason, selecting a vendor knowledgeable and experienced in your industry is essential. 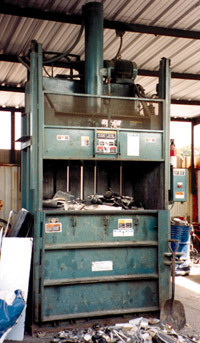 DeHart Recycling Equipment has provided solutions for scrap metal processing facilities, small and large, for over 20 years. We are supported by the most recognized and trusted manufacturers: Harris, Hustler, McIntyre, Sweed.